01:00 – MS spent his childhood watching his father pitch with an orthodox style. 01:45 – Living next to the Halifax Commons, ideal practice space, going to games with father and brothers, keeping score at the Canada Games diamond for senior games. Around 14/15, MS started to get into fast-pitch softball – he knew senior players that mentored him as a young person. 03:20 – Names senior players to catch while he pitched – MS was lucky to grow up during the heyday of fast pitch. 04:20 – Recognized his own skill and knew he was good when he made the Junior Men’s Provincial Team at 16 for an event where players’ avg. ages were 21. First time he could compare himself to other players from around the province and country. 05:30 – Learned to throw hard and to spin the ball as he grew older. 06:15 – Subbed in once as a pitcher for senior team and threw two innings despite his father’s skepticism. 07:30 – MSs father never forced him into the sport, but he did encourage productive, physical activity. He visited games and watched what made players successful – MS was always exposed to the best. 10:00 – Pitched his first no-hitter in Pan-Am history against Venezuela. MS recalls the umpire’s dramatic flair. 11:30 – MS achieved good velocity – 109 mph is fast pitch. He had the high 80s, low 90s on a good day. 12:35 – MS believes exceptional pitchers are met with exceptional hitters. 14:00 – MS’ mental play style did get a few players “halfway to the mound” to fight him, but somebody always stepped in to end the conflict. MS believes that as a hitter he is entitled to a little bit of psychological warfare – smart about game. 14:50 – MS pitched between 50 and 60 no-hitters in his game, but he is more proud of his perfect games. 15:30 – Played semi-professional softball, where the team paid his expenses but not wages. MS was not entitled to work in USA because he had no green card, but he could have expenses paid. Up until his mid-twenties, he and his parents recognized his need to move on to a real job. 16:15 – When his time was up with semi-pro softball, MS got involved with the department of justice, working with young offenders. 16:45 – He once was invited to try out for Kansas City. He was scouted at ISC World championships, a game which he won, but he thought the scout calls were a prank and hung up on scout Sandy Alderson twice before believing him. He was invited to train in 1982 but had to decline due to a grandparent’s funeral. Eventually MS flew to Sarasota to pitch at a development camp for a week, but did not find it to be a good fit. 20:05 – The journey to MS’ 1998 Canadian Title win on home territory began in 1993 with the Keith’s Softball Team. Evolved with team over the 5-6 years it took to make it to championship. The nucleus of the original team remained even though members had moved on to other projects. 22:01 – MS and Bruce Rainnie watch footage of a good hit and MS giving a short interview. That national title on home soil remains a highlight of MS’ career along with winning an ISC title with both his mother and father supporting him from the stands, which happened only once in his career. The National championship was a great way to end a career. 23:25 – Discussion concludes by talking about MS’ younger brother Wade Smith, who had passed away the previous year. MS only came to understand Wade’s impact in Nova Scotia after his death and found it incredible. Wade made an effort to leave something meaningful with his family even as he was dying. His wife and children are successful and holding up well even though Wade’s loss was very public. 26:00 – Bruce Rainnie concludes the program and thanks Mark Smith for joining him. End of recording. Description: One digital video file, colour with audio. 26 minutes and 35 seconds, totalling 1.86 GB in size. 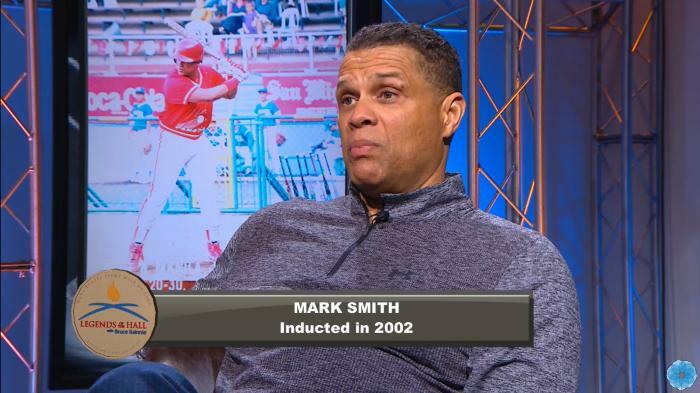 Host Bruce Rainnie interviews softball pitcher Mark Smith for the Legends of the Hall television program, which aired on Eastlink TV.